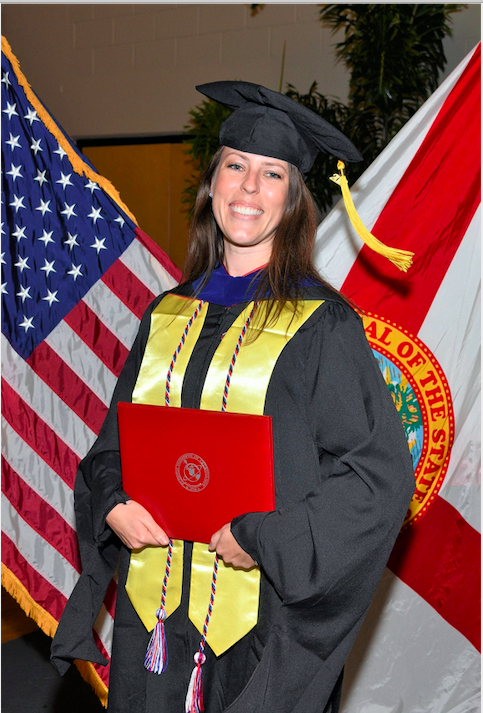 Carly Pallo didn’t have to wait to experience the benefits of her graduate degree. Not only did she immediately gain new soft skills, but she also embarked upon a new career upon graduation. “This degree will help me succeed both in my personal and professional life. It has taught me amazing new skills in leadership, communication and teamwork. I have already noticed an improvement in my life with how I interact, collaborate and work with others. It has changed my life and has opened many doors for me. The Organizational Leadership graduate maintained a 4.0 throughout the master’s program, which can be credited to her vast experience in being disciplined. As a dancer and former servicemember, Pallo knows that dedication and commitment are essential for achieving any endeavor you set your mind to, including education. Earning her master’s degree helped her find a long-term career after exploring a variety of interests around the globe. In our interview, she provides advice to other students for success in the online classroom among other insights into her academic experience. I am originally from Southern California. I was raised by my hard-working Mom and Dad. I also have an older brother. I am passionate about many things in life, which have led me in many interesting directions. My original career began as a dancer and a dance instructor within the performing arts in California. Music, dance, art and education have always been important aspects of my life. The dedication, commitment and discipline from these skills gave me the ability to pursue multiple interests. Years later, I moved to New Mexico and began working at an outdoor recreation facility on a military base. The goal was to engage in other passions of mine: traveling and working outdoors. After being inspired by the amazing people I worked with on the base, I joined the military and served in the U.S. Air Force as a Human Resource Manager. I hoped to challenge myself, serve and gain new abilities to support a well-rounded career. I also picked up a strong interest in leadership. After four successful years, I gained the confidence and experience to follow a life-long dream of working with the U.S. National Park Service. My career started as a volunteer on the Big Island of Hawai’i, a place I always dreamed of living and working. After accepting a seasonal dream job as a Park Ranger, I then moved to Colorado, another place I always wanted to live and work. I was able to share incredible archaeological sites with visitors while supporting the mission based on education, enjoyment and preservation of the land. I was also able to travel to Europe three times during that time span. I will begin my permanent career this year. It has been an amazing journey while living in the most beautiful places. I look forward to using the abilities I have gained throughout my life within my career. I hope to continue following my passions in these areas throughout my life. Some important factors about Florida Tech that supported my decision to study there included a quality online master’s program in Organizational Leadership at a strong, regionally accredited school. Within the program, there were no required days or times to sign-in to my classes, which helped me balance my schedule while working and living in a specific location for the National Park Service. I also appreciated the school’s strong relations with the Veterans Affairs, which allowed me to utilize my Post-9/11 GI Bill. Lastly, the idea of traveling to Florida for a graduation trip was a fantastic plan. I was surprised at how relaxing the online setting was, overall. I no longer had to worry about commuting, parking or getting around campus. I was able to focus on the schoolwork itself. Also, I was amazed at how helpful my student services representative was – he checked in with me weekly, helped me sign up for each class and helped me order my books. That was an improvement from past stressful experiences at previous schools. Everything from class registration to my Post-9/11 GI Bill benefits went through smoothly and I was very appreciative of that. There were many people who inspired and supported me throughout my education. My parents encouraged me to work hard, strive for my goals, and believe in myself. They supported me throughout my educational endeavors, and I am very thankful for them. My fiancé has been a rock during my time in the program. His patience and support helped me more than words can say. The rest of my family, friends, and mentors were also a big inspiration and support system towards my degree. They believed in me to achieve great things. Lastly, my instructors were very supportive as well. They were there for me every step of the way. If I ever had questions or concerns, they were willing to help. Some of the obstacles I faced during the program included a busy schedule which required excellent time management, and at times, sacrificing free time. Other obstacles included difficult assignments, a steady workload and tough virtual group projects. One goal I had throughout the program was to gain as much experience as possible. One way I was able to reach that goal was by leading every group project within the program, which brought its own obstacles. I was also able to manage a 4.0 GPA throughout the program, which came with challenges as well. Any advice for upcoming students? For upcoming students: This is an important step in your future. Follow your intuition about your degree of choice and how it will support your career goals. Take the program seriously and continue to press forward. Practice good time management. Work with your classmates. Communicate with your instructors. Ask questions and submit assignments before the last minute. Have a support system. If times get tough, stay focused. Remember the end goal. It is worth it. From my past as a performing artist, I have picked up many performance skills. One fun fact about me is that I currently own a world record for juggling and tap dancing at the same time. Yes, it’s on my resume. See Pallo’s juggling in action here!